Earn points when you fly with Air Niugini, with the opportunity to earn more points with our program partners. You can join Air Niugini's Destinations Loyalty Program for FREE! 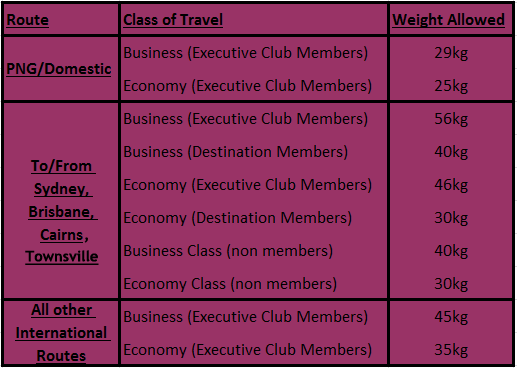 However if you are a serious frequent flyer you may wish to join our Executive Club. As an Executive Club member, you'll receive additional checked baggage allowances when you travel on Air Niugini between PNG and Australia. We request our valued customers to take note of the standard baggage allowance when checking in during travel. Any bag that weighs in excess of the above standard baggage allowance is excess baggage and will be charged accordingly. You must quote your membership number at the time of booking so that you can automatically earn PX frequent flyer points every time you travel.